Hutaib InfoTech Solutions got a well-deserved mention in the prestigious FingerTec Newsletter. The newsletter lauded its efforts to get one of UAE’s premier shipping lines to get its time attendance organized and automated with help of TimeTec TA’s TA200 Plus device. With help of the time attendance solution, White Line was able to streamline its workforce management problems with total ease. The end to end solution helps in clocking activities, scheduling, report generating, and even job costing. Since user licenses are sold in blocks of 10, the system faces no obstacles in scaling up to the company’s ambitious growth plans. Hutaib InfoTech Solutions’ extensive experience in the field of high performance CCTV, Video Surveillance, Time Attendance and Door Access Control Solutions made it possible for it to implement a smooth working system at strategic locations across multiple offices of the shipping company. TimeTec’s TA200 Plus is a modern day time and attendance solution that goes beyond conventional systems and offers a power packed performance. It banishes routine time and attendance problems such as proxy or buddy punching, and provides a huge storage capacity for the management to analyze at a later date. 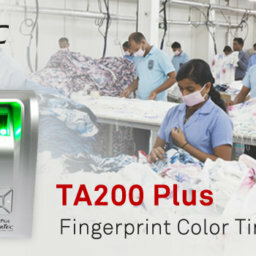 The TA200 Plus also includes a workcode feature where employees can key in the workcode that applies to them when clocking on the terminal. This helps system administrators to note the remark based on the work code, determining the purpose of the clocking activity and making job costing tasks that much easier. Hutaib InfoTech Solutions is UAE’s emerging leader in Information and Communication Technology systems (ICT) supply. It has one of the biggest bouquet of offerings that includes high-level Security & CCTV Surveillance Systems, Time Attendance & Door Access Control Solution, Structured Cabling and Wireless Networking, ICT & IP Telecommunications Systems. Some of the prestigious names on the client list of Hutaib InfoTech Solutions include leaders in the Commercial, Government and industrial sectors throughout the UAE. Congratulations. Hope you can bring the same solution to Oman by participating in the upcoming Comex exhibition ( ICT event ) from April 23rd to 25th, 2018. If you are interested please contact me Ashit I. Barnes at barnes@oite.com or on mobile + 968 99341687.